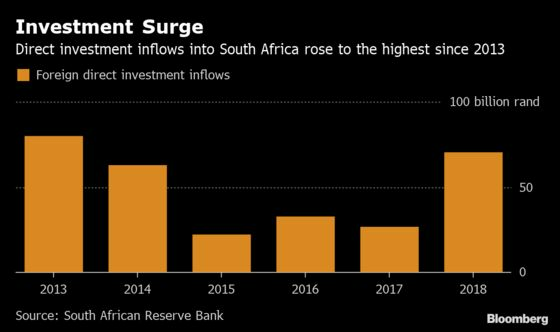 (Bloomberg) -- Foreign direct investment into South Africa jumped to a five-year high in 2018 as President Cyril Ramaphosa’s efforts to attract $100 billion of investment over five years gathered pace. Direct investment inflows increased to 70.7 billion rand ($4.9 billion) in 2018 from 26.8 billion in 2017, the South African Reserve Bank said in its Quarterly Bulletin released Wednesday in the capital, Pretoria. Ramaphosa hosted an investment summit in October in which companies including Daimler AG’s Mercedes Benz unit pledged to invest $20 billion in South Africa. The country, whose economy hasn’t expanded by more than 2 percent since 2013, also got commitments from China, the U.K., the U.A.E. and Saudi Arabia. Direct investment by South African companies abroad jumped to 23.3 billion rand in the fourth quarter, from 13 billion in the prior three months after a domestic insurer acquired a company abroad, the bank said. Sanlam Ltd., the South Africa’s largest property and casualty insurer, bought out Morocco’s Saham Finances SA in the continent’s biggest insurance transaction of 2018. Foreign investors sold a net 33.9 billion rand in stocks and bonds in the fourth quarter compared with an inflow of 17.9 billion in the three months to Sept. 30. Portfolio investments by South African residents abroad jumped to 29.3 billion rand from 2.8 billion rand over the same period largely due to companies acquiring foreign equity and debt securities. On a quarterly basis, outflows of foreign direct investment amounted to 8.2 billion rand in the fourth quarter from an inflow of 28.7 billion rand in the third quarter after the repayment of short-term loans by South African subsidiaries to foreign parent companies, the central bank said.